The Lava Red edition is the latest in the series of special editions of the OnePlus 5T. OnePlus is on a launching spree! After launching the OnePlus 5T a mere four months after the OnePlus 5. Then they followed it up with a Star Wars Limited Edition. It was followed by the Sandstone White Limited Edition. The best part of these limited editions was their price. It was the same as the regular edition. Now, OnePlus is ready to launch the latest iteration of the 5T, the Lava Red edition. OnePlus describes it as a radiant red colour which is inspired by the dynamic nature of lava with colours that change under different types of light. Internally the smartphone carries the same specifications as the rest of its brethren. Like the previous special editions, this one is only available in one variant, 8GB RAM + 128GB Storage. OnePlus claims to achieve the radiant Lava Red colour through an extremely accurate combination of temperature, consistency and baking time which has less than 0.01% variation. It uses two anodic oxidation processes along with double blasting and an AF coating which ensures its signature texture and feel. The final finish is smudge-proof and feels very premium in hand. The registrations for the OnePlus 5T Lava Red edition have already begun on Amazon India from 11th January. It will go on sale on 20th January at 12:00 noon. The optics on the latest edition are the same excellent dual-camera system comprising of a 16MP and 20MP sensors having a f/1.7 aperture. It has the same Snapdragon 835 processor paired with 8GB RAM and 128GB of onboard storage. The display is still the gorgeous 6-inch, Full Optic AMOLED with an 18:9 aspect ratio. It also supports the Face Unlock feature which had debuted with the original OnePlus 5T. OnePlus have included a completely redesigned wallpaper unique to this edition to carry the Lava Red experience one step further. 20th January 2018 will also mark the day when OnePlus opens their first-ever authorized store in India. OnePlus is going offline! 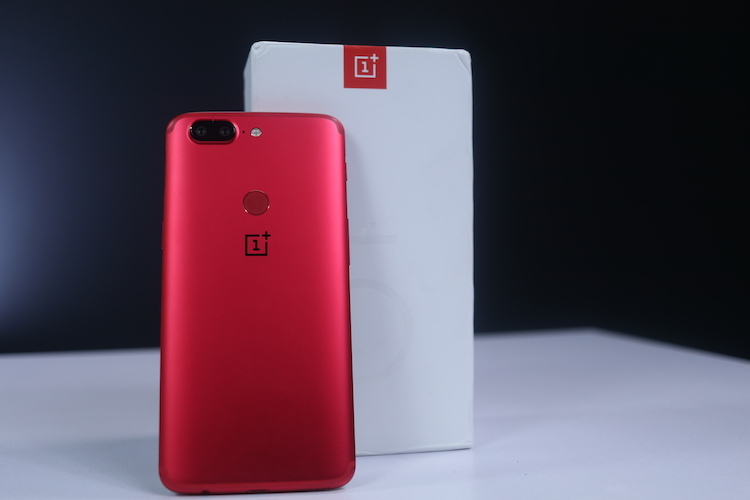 The launch of their first-ever authorized offline store is coinciding with the launch of the Lava Red edition of the OnePlus 5T. The store will enable customers to experience OnePlus phones and accessories first hand and also use and test the devices thoroughly before buying them. India’s first OnePlus Authorized Store is opening in Mumbai. OnePlus will be celebrating the grand opening of their maiden store in style. All the early birds will get a pair of Bullet V2 earphones free on the purchase of any OnePlus smartphone on 20th January 2018! The latest Lava Red Edition of the OnePlus 5T will also be available to experience at the store! Prime Mall, Irla CHS, Irla Society Road, Vile Parle (West), Mumbai. So, how many of you are going to visit the OnePlus store? If you do visit, share your experience in the comments below. "OnePlus Launches Lava Red OnePlus 5T; Mumbai Store Opening Today! ", 5 out of 5 based on 2 ratings. Honor 9 Lite Vs Xiaomi Mi A1 Vs Moto G5S Plus – Dual Camera Mid-Rangers Battle Royale!